So, my self imposed restraint of not buying new stash hasn't been all that successful this year LOL but I have cut down an incy wincy bit. Anyway, I've made up for it by selling some cross stitch kits on ebay last week and that actually fetched me a fair bit (but my goodness ebay sure take a wedge out of it don't they, with their 10% fee!). Having said that, think I'm going to have to sell a bit more after my recent visit to the dentist. Though it's my own fault as I really don't like them and have not been for a looooong time. Fillings aren't cheap are they?! 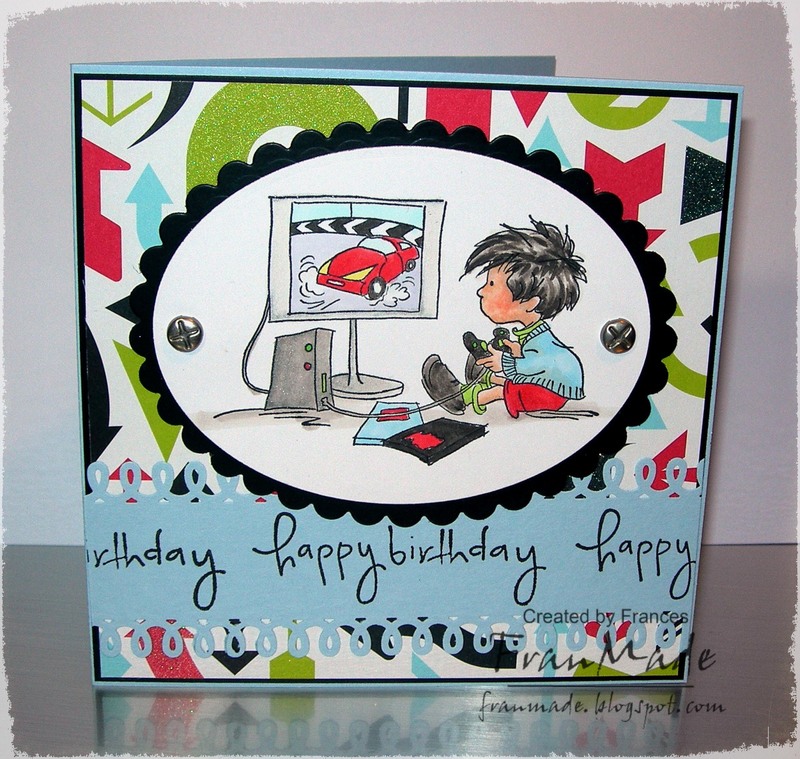 Anyway, back to my card I'm showing today. I've always loved the quirky looks of the Some Odd Girl images but I am old school and like to stamp my images (plus I've got c**p printer that's no good with Copics) so I was over the moon when I saw their clear stamps release and snapped 3 up. They turned up sooo beautifully wrapped as well. Kept the inside simple and just die cut matching shape in white for writing on. It's not great photos as I took it late at night (when I do most my crafting nowadays apart from my 1 day off on Sun) but 1 of the big reasons I love metal dies over say punches is that you can cut out felt and make fab little embellies like the roses on this card. they are way cuter IRL as I've added a teal coloured gem brads to the centres which you can't see that well in photo and they are a lovely shade of wine which does actually match her skirt. Others: black brads, red thread & sewing machine & black viva decor pen for her black pearl necklace. Colouring: Copics with a bit of Sakura stardust pen over the games console and tv to give it a sparkly metallic look. 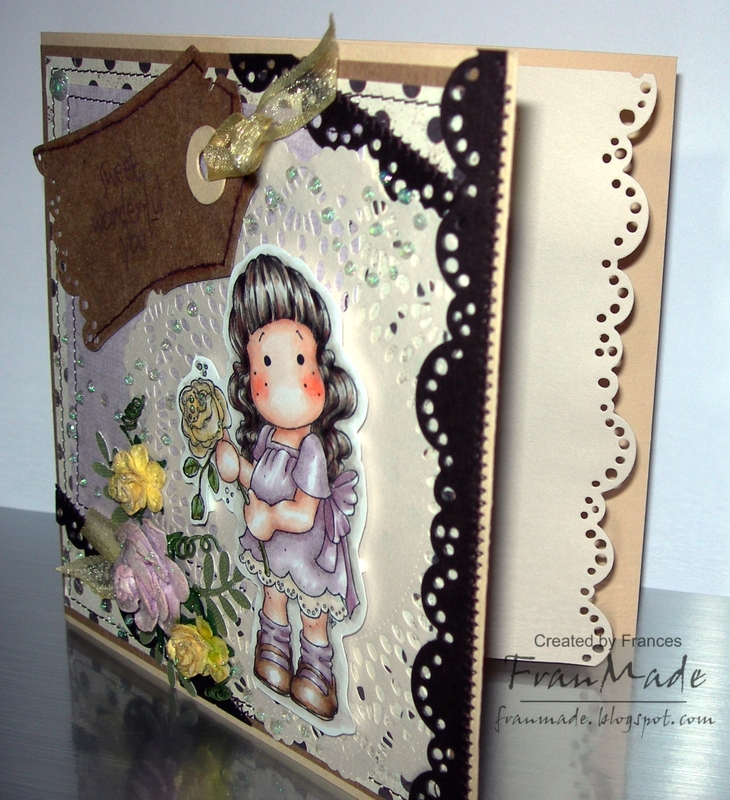 Yeah, I can play along to the Just Magnolia challenge this week :) which is 'anything goes' and optional extra of 'stitching' which I have on this card - both real and faux. I've had this cutie coloured up (Copics, what else?!) for months now and I finally got round to using her. I've popped her on 3d foam and put her over another fab Die-namics die - high tea party doily. This is actually a whopper of a doily and bigger than I expected (should have read the measurements shouldn't I?!) but that's not a bad thing as it just means I can get other smaller ones LOL (got my eye on the Cheery Lynn american heartland heart die - isn't it fab?! ;) ). So as I didn't want all the background covered I've placed the doily off centre. Used some MME Papers, kraft card, Magnolia tilda lace border die and tag die, lots of brown stitching, couple of Wild Orchid craft roses, EK leaf punch, ribbon, spritz of glimmer mist and pearl swirls courtesy of viva decor glitter liner pen. 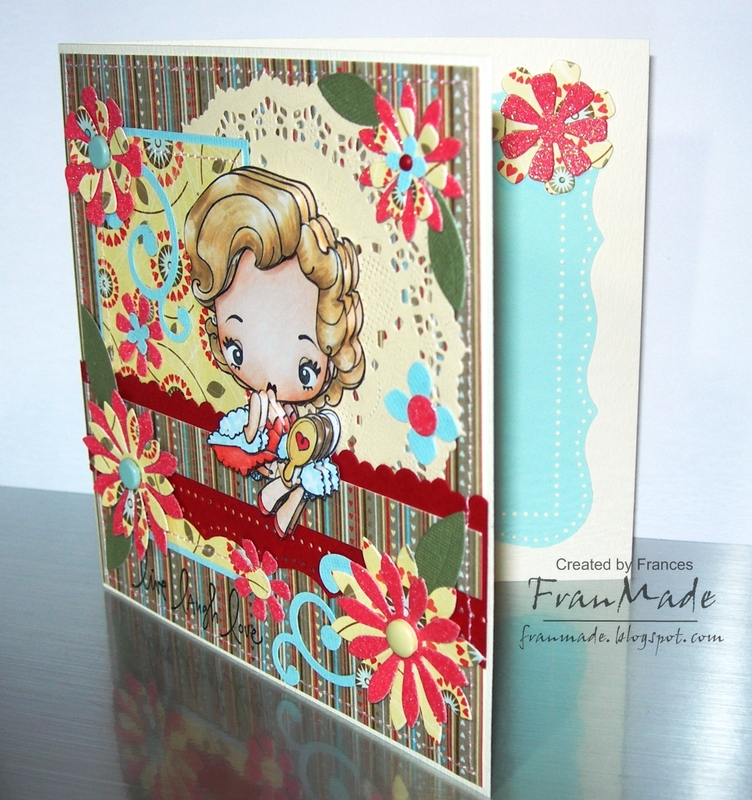 Kept the inside simple and just lined it with some cream paper using the same tilda border die on the edge. Hope you likey. Have a fab weekend, supposed to be a hot one here in the UK, but so far all we've got is grey and humid! 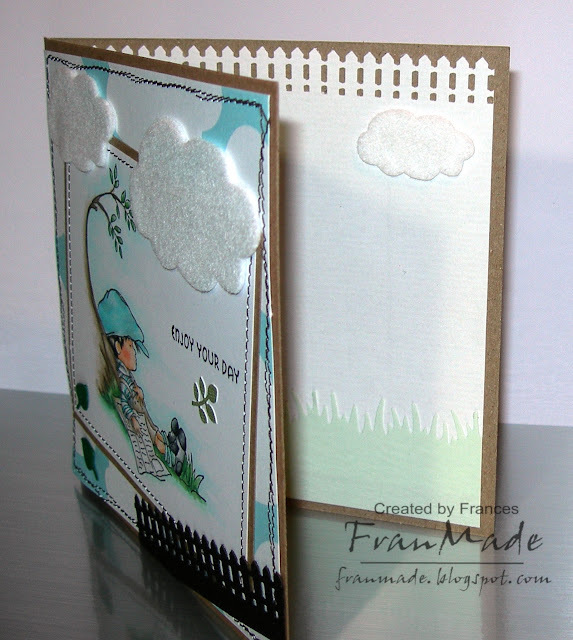 Here's a boy card I made - need to make more, never seem to have them at hand when I need them. Tried to find a challenge that I could enter this in but couldn't find any, typical! So here it is. I actually quite like making 'boy' cards as they require less 'stuff' so it stops me from over thinking and adding loads of embellies. 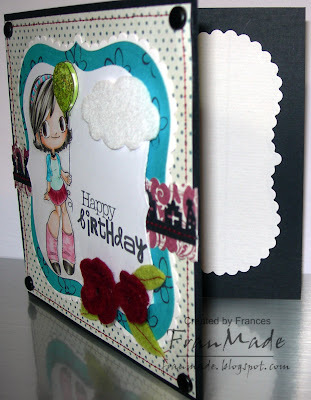 Though having said that I had fun with this one by using some die cut felt clouds (Die-namics die - see, told you they were my latest obsession!) and some leaf brads that I've had forever in my stash. Cute image is a LOTV stamp that's been coloured with Copics. Bottom right corner looked a bit bare so placed a fence border there using my MS border punch. Used a kraft coloured card blank and a piece of sky patterned paper (by American crafts I think) with lots of wonky (accidentally on purpose LOL) brown machine stitching around the edge. All pretty simple but I like it. I've got another LOTV boy card that I made for my nephew but will save that for the weekend as the photo's on my pc at home (at work at the mo). Hello again. Was supposed to have posted this last week but never got round to it . .oops. Made this card with the left over papers and image that never got used on the commissioned 60th card as it was considered too young. 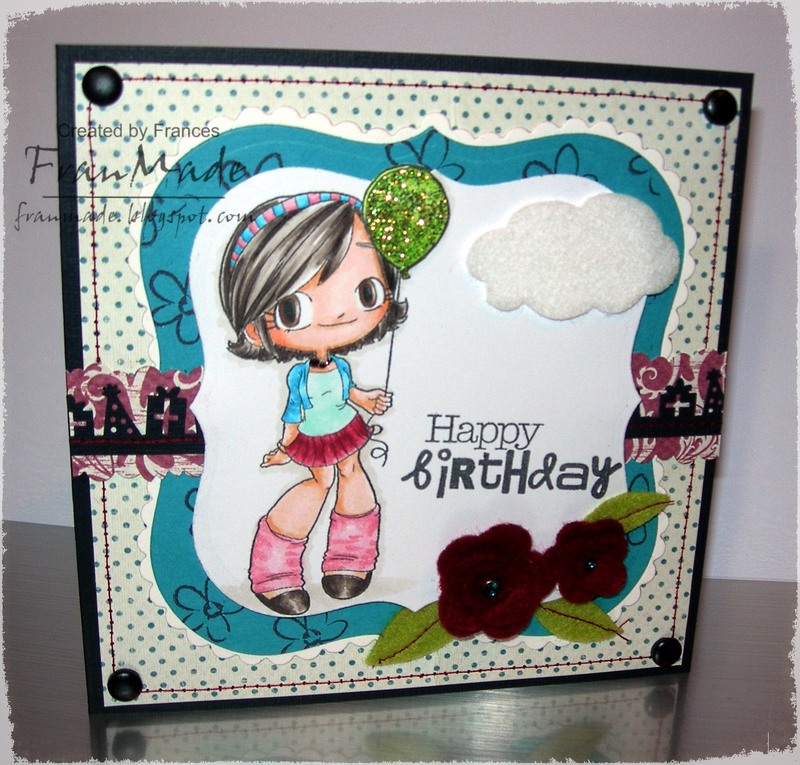 I love this cutie from The Greeting Farm and had great fun decoupaging her. Coloured with Copics as usual and the fab doily behind her is a free sample that I got from one of my orders from Dies to die for. It's cut from a Cheery Lynn Die (kiwi spirit doily) and I love it so much that it's on my 'to get' list along with the gazillion other things I want/need! Flowers made using various Dienamics flower dies and I've just stuck a brad through the centre of them all. As you may have noticed, my current obsession (besides stamps) is all the fab dies coming out, especially the 'Dienamics' range from MFT and the Cherry Lynn Dies. Papers not sure who it's by as it was a random 12x12 piece plucked from my loose stash. Finished off with some stitching and used couple of border punches on the red panel. Also decorated the inside to match but nothing too fancy. Right, best go schedule all the other posts before I forget again.